In this video, we get tight—and loose—with Ask This Old House plumbing and heating expert Richard Trethewey. 1. Grooved-joint pliers quickly adjust to grip several different sizes of hexagonal and square nuts and fasteners. 2. 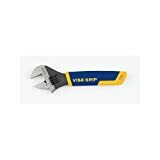 To prevent grooved-joint pliers from slipping, always grip the nut so that you're pulling the handle toward the pliers' smaller, adjustable jaw. 3. Combination wrenches come in a wide variety of sizes. Each has an open-end wrench on one end and a box wrench on the other. 4. 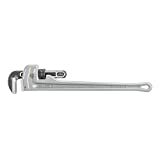 An adjustable wrench features a cylindrical-shaped knurled nut that allows you to adjust the opening between the jaws. 5. Grip round pipes with a pipe wrench. 6. To avoid damaging the pipe, take a three-corner bite. Be sure the wrench contacts the pipe at the fixed heel (bottom) jaw, at the adjustable hook (top) jaw, and at the beam, which is the long section of the hook jaw.